After several weeks of procrastination and head- scratching, I come up with a plan: our primary students will study our classroom decorations of Indonesian heroes followed by a team-based quiz in the library (I am very glad to enlist the help of several primary teachers, who proved invaluable at dealing with our youngest students). Our secondary students will conduct a historical investigation into the man commonly considered to be the founding father of modern Indonesia, Soekarno. I will put up evidence such as extracts from textbooks, photos, data and statistics, and quotes, throughout the school: in teams, they are to film their investigation using iPads, and come to a conclusion on the question of whether he was a true hero. There are very few balanced sources on Soekarno and Indonesian independence. Local textbooks provide a rather nationalistic view of his role in the revolution; foreign textbooks are rather less flattering.This leads to a dilemma. Much of the evidence suggests that Soekarno was not the hero he is revered by many to be. 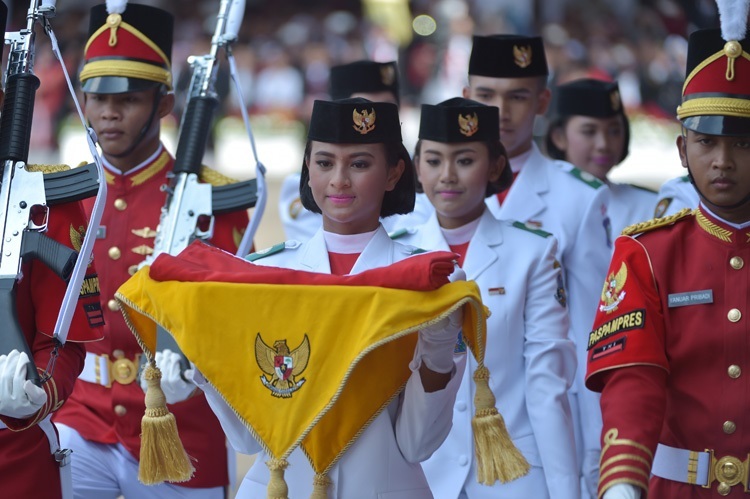 However, it does not seem at all right to conduct an exercise where the conclusion could sully the reputation of the key figure in Indonesian independence just as the country is celebrating its anniversary. It reminds me of an episode of The Simpsons, where Lisa researches Springfield’s founding father, Jebidiah Springfield, for Springfield’s annual celebration, only to find he is a fraud. After much soul searching, she decides to keep this fact to herself because she believes that the myth of Jebidiah still has value. And certainly Soekarno’s legacy has immense value for Indonesia, and I do not want to tarnish this image. However, as a history teacher I want to encourage my students to question the reliability and provenance of sources and to seek answers to difficult questions. In the end, I provide evidence showing both an Indonesian and International perspective. I want the students to think for themselves, and come to their own conclusion. On the day. things run smoothly, and I am pleased that the secondary students come to a variety of conclusions, but largely with a similar theme - that ‘Sukarno was a hero, but was flawed like the rest of us’. If just one of those students takes up an interest in history as a result of the day, then it will have been a success. Back in the classroom, and my secondary 4’s have finished studying the League of Nations, and we now look at ‘Why had international peace collapsed by 1939?’ I wanted my students to think of Hitler’s foreign policy in terms of poker - his bluffing over the Rhineland and Sudetenland, and how Britain and France only call his hand over Poland, when arguably their best opportunities had already passed. I wanted to actually stage a game of poker, showing each event as a hand, including how much Hitler gambled on it, and what his actual cards were. Unfortunately, my school’s Christian ethos meant I couldn’t do it, but I think it would have been a lot fun. I had to settle for making a snakes and ladders game for the road to war, with the ladders being Hitler’s successes (i.e re-armament, Anschluss etc), and the snakes being the counter-measures the West took to stop him (Stresa Front, appeasement etc). The aim was to get from the first square in 1933, to Poland and WWII in 1939. Firstly, the students had to correctly identify which events the snakes and ladders were, and then they played the game. I was taken aback that some of them did not know how to play snakes and ladders, but maybe I am just showing my age here. With my secondary 3 class, we are still looking at ‘Who was to blame for the Cold War?’ I always include a brief section on Mutually Assured Destruction, because I think it’s relevant to explaining the tension, and it’s a great excuse to show them Dr. Stangelove. I arranged the lesson as a role-play, with the students facing the same dilemma as President Muffley - an all out attack on the U.S.S.R or try to negotiate, thus leaving America vulnerable to a potentially cataclysmic attack? A lot of the humour went over my students heads, but I doubt I would have found it funny when I was 14. However any lesson where I get to watch Peter Sellars in class is a winner in my book.